LFWM, internationally recognised as the home of emerging menswear talents, did nothing to dim its reputation this season. 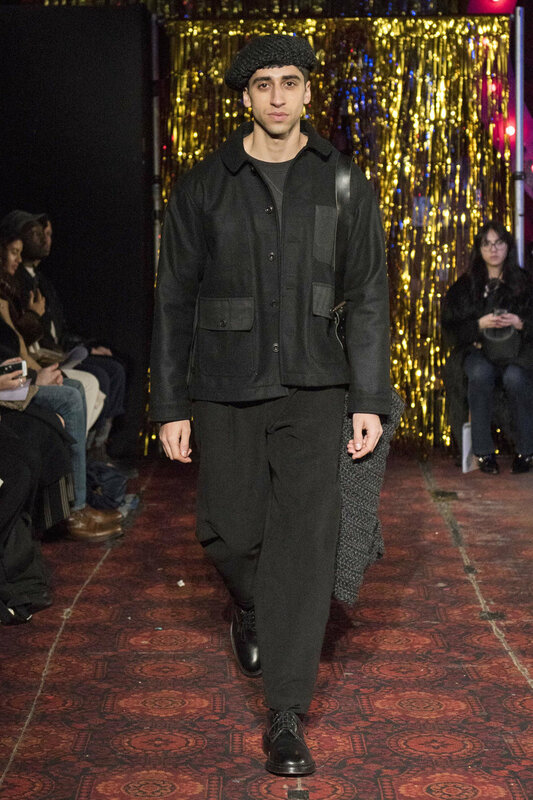 Despite with the tragedy of losing Joe Casely-Hayford, one of the country’s finest menswear designers, the capital rallied to showcase, not just exceptional fashion, but a reflection of modern Britain. 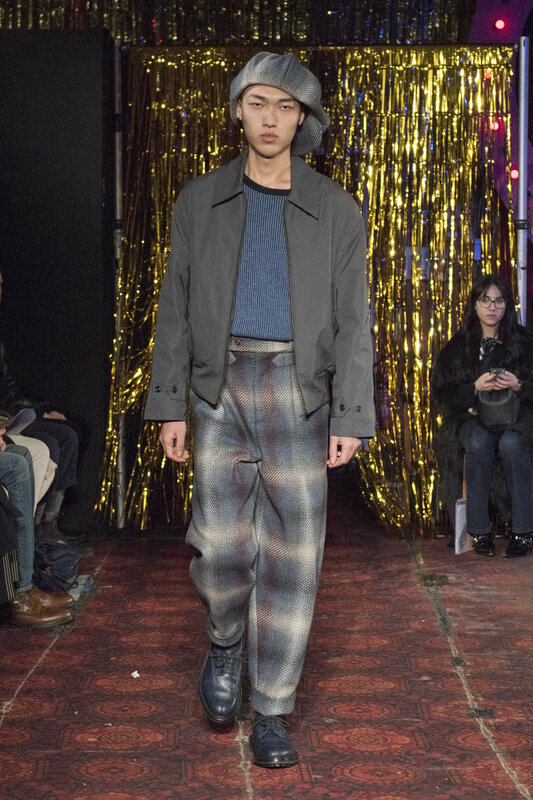 Thanks to contemporary iterations of traditional styles such as the kilts that walked the catwalks at Iceberg and Charles Jeffrey’s Loverboy, Patrick Grant’s reliably great tailoring at E.Tautz and Nicholas Daley’s use of handsome Scottish tweeds, the UK was quietly and sartorially celebrated. 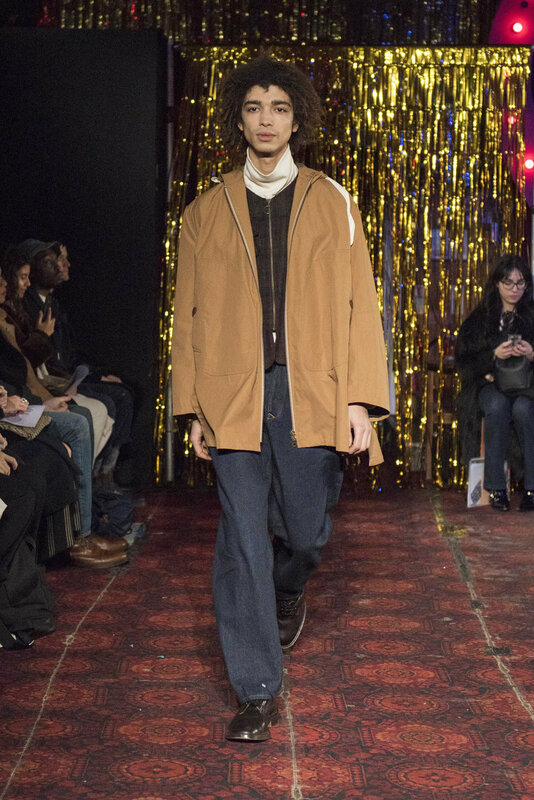 While official figures from the British Fashion Council show that the menswear market continues to grow, this season saw savvy designers relying less on shock tactics and instead producing commercially assured collections. As ever Nataal was on hand to capture it all and here are five of our favourite AW19 shows. Showing at Matches’ Mayfair townhouse, Bianca Saunders developed her exploration of the black male identity. Setting her collection in the bedroom, ‘Unravelling’ looked to showcase men at their most vulnerable and intimate. Playing with a range of fabrics – from sleek nylons and leather, to soft cottons and jersey – and manipulating them into delicate curves, pleats and twists, this season her work was prettier than ever before. An interplay of femininity with masculinity, short shorts and loose knits exposed a softer side and made her models vulnerable, while use of leather outerwear was like the tough shell of traditional male behaviour. With its sleek, minimalist colour palette, Saunders’ work is a masterclass in saying so much without recourse to yelling. 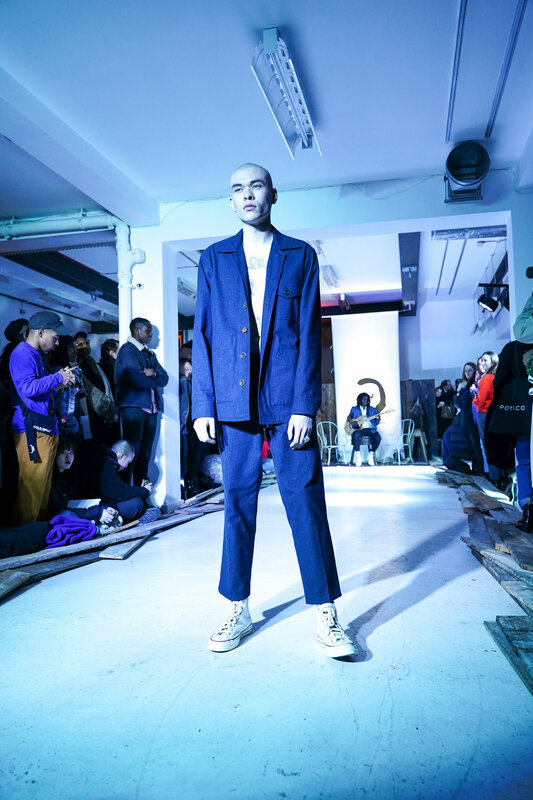 Set to the soulful sounds of emerging artist Puma Blue and legendary producer Dennis Bovell, Nicholas Daley’s fourth outing as part of the British Fashion Council’s NewGen programme was a salute of multicultural Britain. 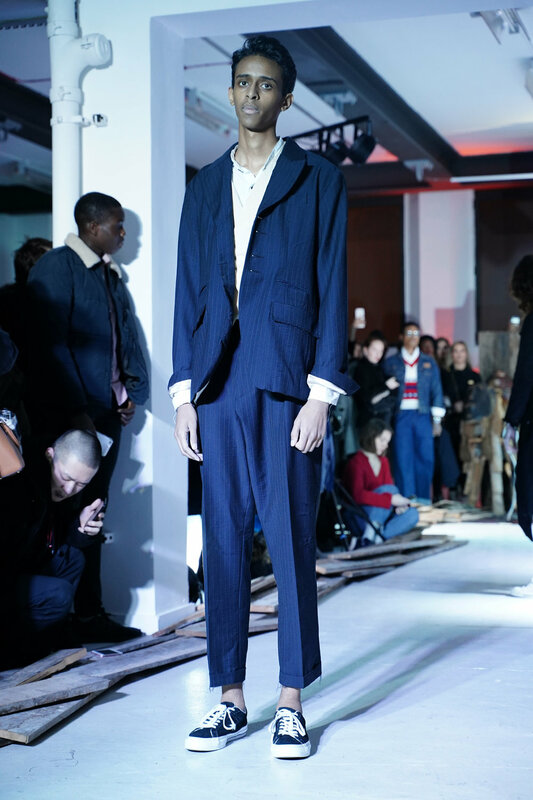 Drawing on both his Scottish and Jamaican heritage, the young designer worked with Scottish mills for his heritage checks, which he turned into handsome silhouettes, strong coats and tapered trousers being particularly impressive. He also made workwear pieces out of denim from London’s Blackhorse mill. With authenticity at its heart, Daley’s AW19 collection paid tribute to British manufacturing and the country’s creators. Showing under Fashion East’s umbrella for emerging talent, Mowalola’s eponymous catwalk show was charged with unabashed sexiness and full to the brim with self-expression. This recent Central St Martins graduate presented ‘Exposed’, all sleek, skin-tight and full of the kind of clothes that are designed for the dancefloor. Bum-skimming trousers and micro minis met tight-fitting tiny tops, cut-outs and sleek silhouettes. With plenty of skin on show, the fabrics used were considered with just the right amount of pow. 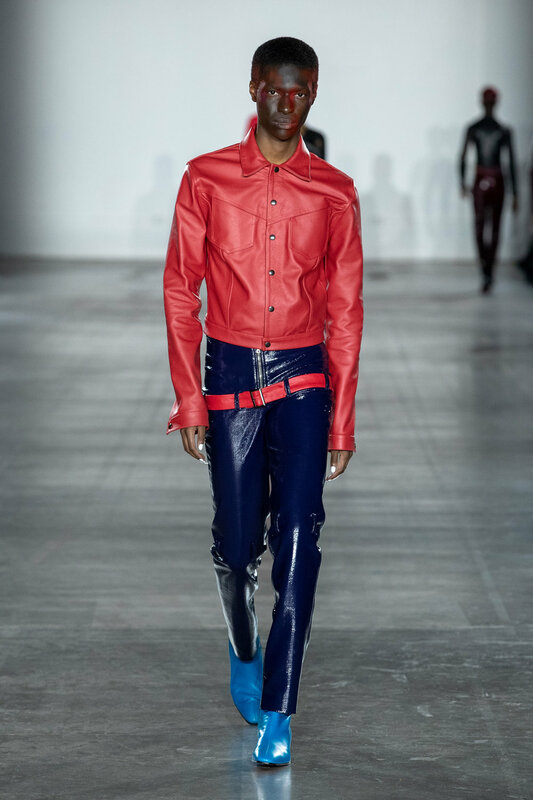 Crafted from sleek leathers, high-stretch tie-dye and bold patent, across both menswear and womenswear, it was a display of unapologetic eroticism. One to watch. 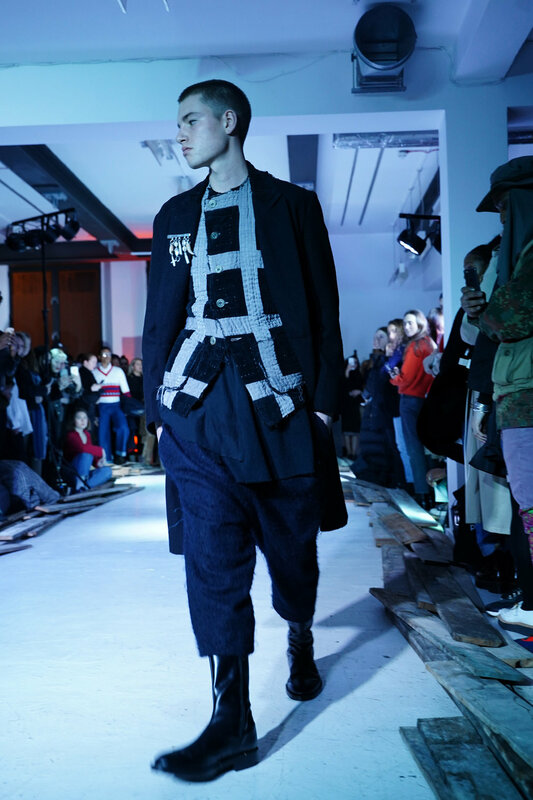 For her third LFWM outing as part of NewGen, Paria Farzaneh continued to repurpose traditional Persian textiles, mixing them with technical fabrics to create a contemporary uniform. Titled ‘Here We Are, Now’ the show invite was also an invitation to the audience to stash their phones and for that brief period of time, live in the moment. With their faces transfixed by their phones, models didn’t walk but instead stood on a conveyer belt which took them to a transparent cage as a melancholy soundtrack played. 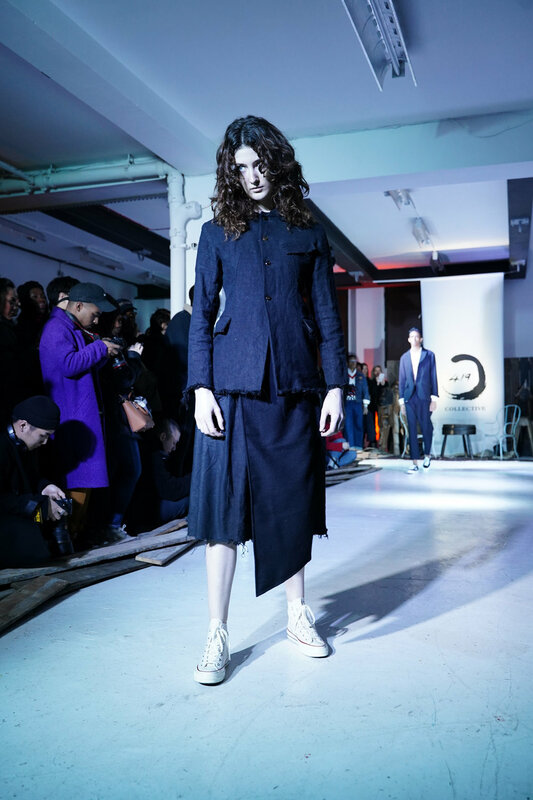 Drawing on loose streetwear silhouettes and contemporary tailoring, she created a clever collection that would be as at home in her native Yorkshire as it would on the streets of Tehran. These practical and hardwearing pieces were joined by bold, patterned knitwear as this young talent’s palette moved from muted to include primary pops of colour. Which meant that while the music might have been mournful, the collection was anything but mundane. For their first outing together, this season’s LFWM saw Labrum, Oluyibi Thomas and Monad come together as 419 Collective, a group taking 419 – the Nigerian criminal code for fraud and slang for scam artists – and repurposing it to reflect a new wave of creatives doing things for themselves. 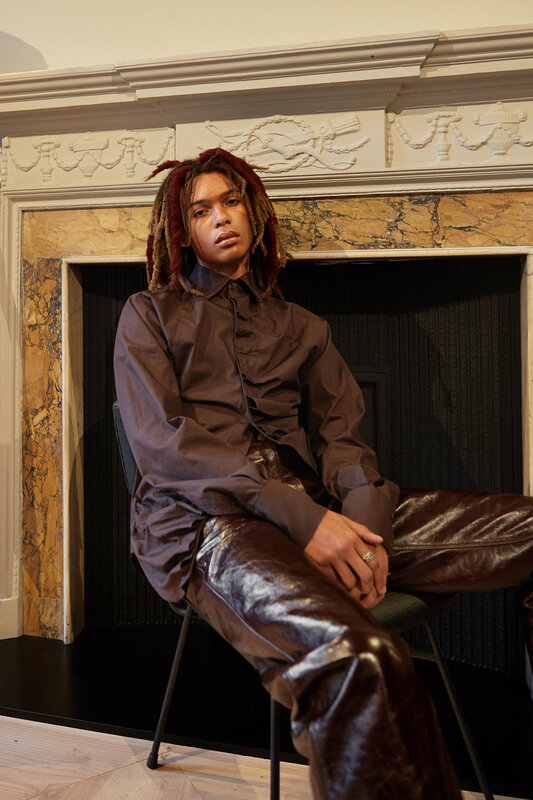 As three distinct shows that flowed into one another, Monad opened up proceedings with a haunting presentation of traditional tailoring that traversed womenswear and menswear by designer Daniel Olatunji. 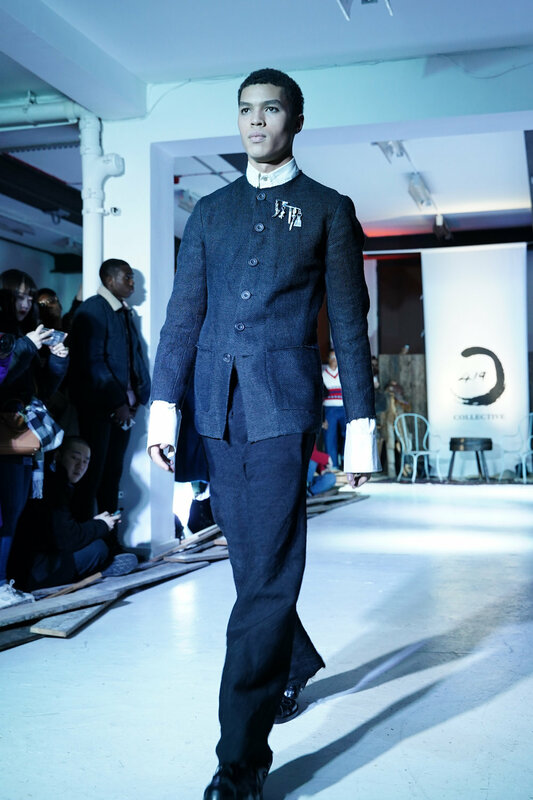 Next up was Oluyibi Thomas, whose collection saw classic British tailoring merging with contemporary African styling. Known for his use of geometric shapes, nods to the far East were in evidence too, with flashes of the Korean hanbok and classic Japanese necklines. Rendered in natural fabrics, his work continues to be a big, beautiful melting pot of sartorial influences. And as the evening’s finale, set to a live band, Labrum continued to explore designer Foday Dumbuya’s reconnection with the highlife music of his childhood. ‘Highlife Electric’ celebrated Sierra Leone’s work to live ethos with beautifully made pieces that fuse utilitarian design with an emphasis on detail. The relaxed tailoring and the clean aesthetic that the designer is fast becoming known for was expressed by the use of oversized pockets, indigo fabrics and handsome prints.